A church greeter wore so much cologne that my eyes watered when standing in his presence. A search of Twitter reveals that church greeters say the dumbest things. The mistakes of church greeters was one reason a family quit going to church and raised their children without faith in Christ. Another family remembers the pain they felt in being ignored. don’t think of their impact on the lives of your members or visitors. You are the welcome ministry leader. Your heart beats with a vision of what awesome church hospitality can do. You know that awesome hospitality can lead to your guests inviting friends. You have poured your heart out in prayer for your church visitors to come. You’ve prayed for your church members to be inviting others to come to church. You’ve thought about ways to measure the impact of your hospitality ministry. It breaks your heart that an awesome ministry experience was not achieved because of an careless greeter or other volunteers in your welcome ministry. One of the hard roles of a church hospitality ministry leader is to correct behavior that can have long reaching negative consequences. Let me give you a few tips I’ve used to provide feedback to church greeters and correction to careless mistakes by hospitality ministry volunteers. 1. Pull them aside and remind them of the hospitality vision. Personally meet with your volunteer and refresh the vision of awesome hospitality. Describe what you want the hospitality ministry to look like. Remind them of the power of hospitality to affect the life and faith journey of people attending your church. Help your volunteers find their “why?” by reinforcing the vision of life impact that is possible through a warm welcome. Become a seeker of great welcome stories and use them! 2. All feedback should be given in love. 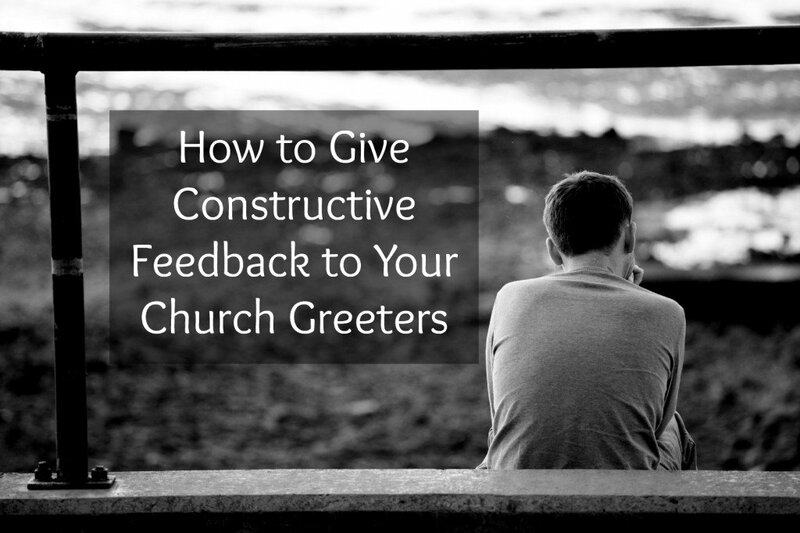 Our goal for feedback to your church greeters is to build them up for their service in the ministry. When your volunteer knows that you love them and that you want their best, your feedback is often heard well. How their ministry is going. How they think their service is blessing guests. Where they are having difficulties as a volunteer. How they think they could improve to be a better blessing. Taking notes during such a conversation can communicate love and value. Their responses are important to YOU. 3. Invite your volunteers into excellence. How do you think this task can be made more effective? Have you tried doing _______________ this way? At the church we attend, we constantly remind people that “Excellence increases influence.” If the goal is to influence a life, then excellence plays a role. 4. Include Positive Feedback if possible. Always include positive feedback in your conversations. Give positive examples of what is working well and share how pleased you are with the right stuff. Such positive feedback can reinforce good skills, and even motivate a volunteer to better heights of service. 5. Cover that corrective conversation in prayer. Prayer gives you the time to get God’s heart for your volunteer and for the ministry. Prayer also gives you a sense of perspective about God’s work in the life of your church and the volunteers. 6. Regular remind the entire team of excellence you expect. I recommend a regular series of vision casting meetings with your hospitality team. I suggest a schedule of at least 3 times a year. a place to layout your expectations of the work that you expect your volunteers to give. You carry the value of hospitality as one of the core values of your church. You’ll need to regularly call your volunteers back to a high level of service. You’ve got to call them forward to better service. It is your role to make sure these church hospitality stories do not exist in your congregation. As a ministry leader, would you share with us other tips in how to provide constructive feedback? I invite your comments below. What one tip would you add? Starting a new role as leader of your church welcome committee? Hello Chris, God bless you for your valuable Hospitality insight, articles, & love for this particular ministry. I’ve started our Hospitality team 3/4/18 with 16 greeters. I very proud if the team’s dedication, & work. I plan to have quarterly training sessions, to reinforce your materials, values. Yes, have a couple slackers, with this timely article, I believe I can address future issues!! I have a file of your articles, which would you recommend best for our next training? Would you agree if I periodically travel to highly successful greeter churches to help boost our greeter services? Thank you Chris Walker, God Bless you!!!! Thank you very much for sharing this inspiring article. We began our ministry of welcome at the beginning of March of that year. It has been wonderful to see what God is doing in our church. We are a Baptist church in the interior of Brazil, but it is connected in the vision that you have taught us. Hugs. Just one small thing … The family who quit coming to church because of a greeter … well, there is more to their decision, surely! While it would be an extreme reaction to be offended by ONE thing, and therefore easy to dismiss such a person as hypersensitive, I don’t ever want to be PART of any reason, or give any cause to why a visitor would reject our church. The gospel can be offensive, but we volunteers shouldn’t be. Let the gospel be the people reason choose not to come back, not our cold tolerance of the presence of visitors. Really encouraging post, Chris! Thanks for the reminder of the importance of a warm welcome. Nahdia’s story was particularly inspiring. Thanks for sharing, and keep up the great work. Thank you for your well done videos. Even us older greeters need to be reminded of the very basics. My wife and I lost our 21 year old son in a tragic motorcycle accident. We had been attending church but felt that as part of our grieving, we would visit a different church where we didn’t know anybody, and we could cry if we needed, as part of our grieving. Now a word of advice to greeters. Be careful of what you say when you don’t know the visitor. About 3 weeks after our loss, we visited a different large church,were handed a bulletin and the greeter thought he was being friendly when he said, Why the glum look, surely you can be happy about something. He didn’t know us so I can’t fault him for trying to make us smile but we were not ready to joke with a complete stranger.